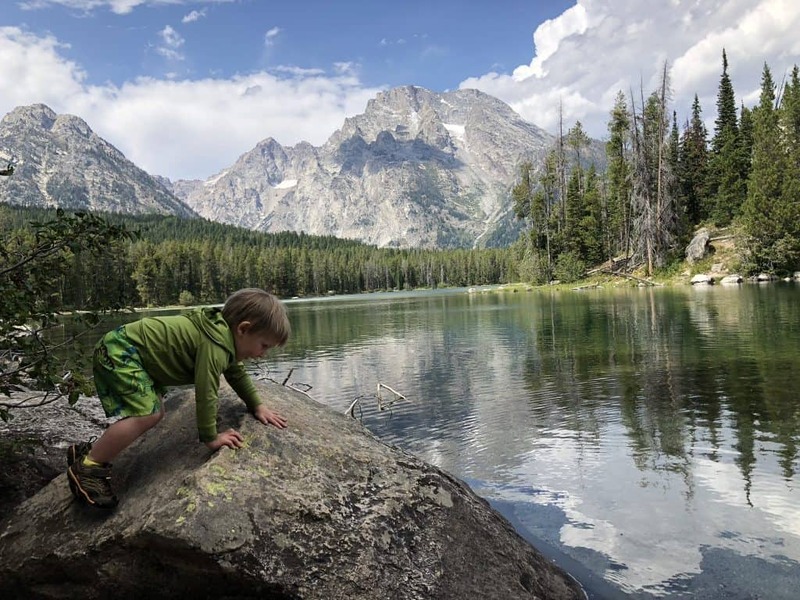 These 6 Grand Teton National Park Hikes are the best around… and the whole family can do them! 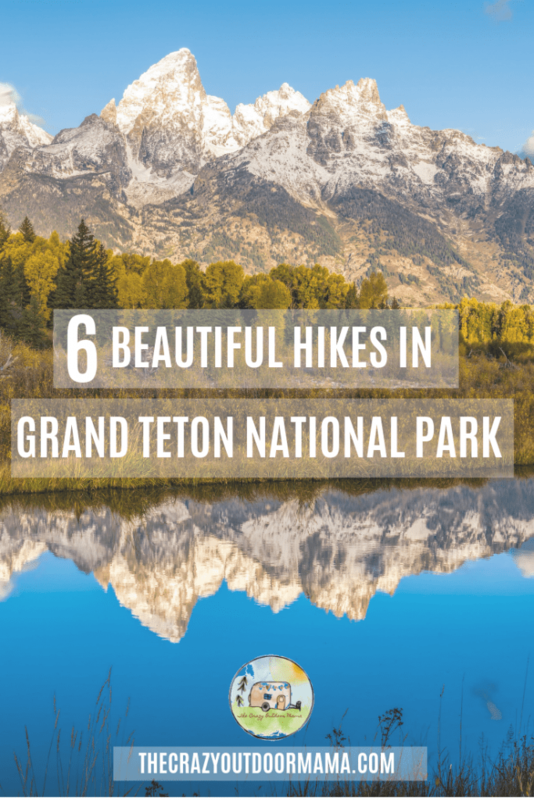 If you are in the Grand Teton National Park/Jackson Area, you might want to check these out too! Did I miss anything fun in Grand Teton National Park? Here are some other reads you may be interested in! 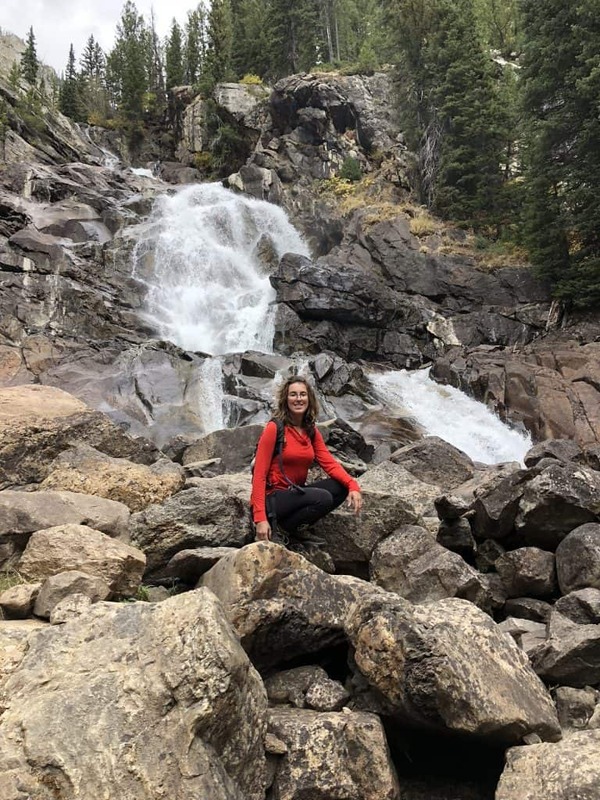 One thing I love about Grand Teton National Park is that there are quite a variety of hikes for people of all skill levels – in fact, most of the beautiful spots are a quick, low difficulty hike! My grandma came out recently for my twins birthday party, and of course we loved to play tour guide and show her everything! We sort of had an idea of what to check out seeing as we already picked hikes that were a little easier due to our 3 little kids, but it was awesome getting to see some of the stuff we skip over. We knew it was beautiful, but I guess it’s one of those things where if you know it’s there every day, then you sort of take it for granted. 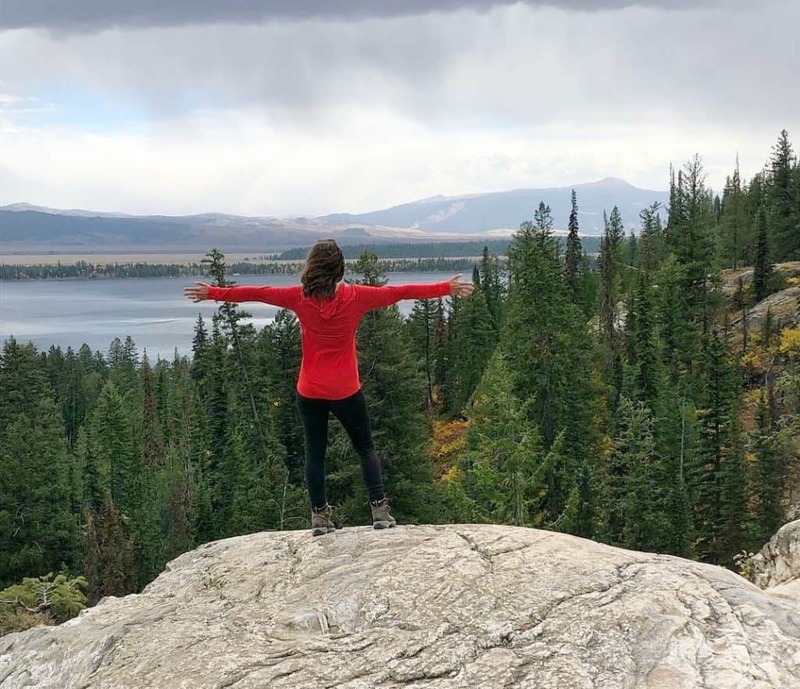 There are lakes, beautiful view points, and so much more in Grand Teton National Park! The trails are really well maintained and marked, so it’s a perfect spot for both young and old! Anyways, here are the top hikes/places in GTNP! I am going to try to list them in order of difficulty/length so that you can pick and choose accordingly depending on who is in your party. 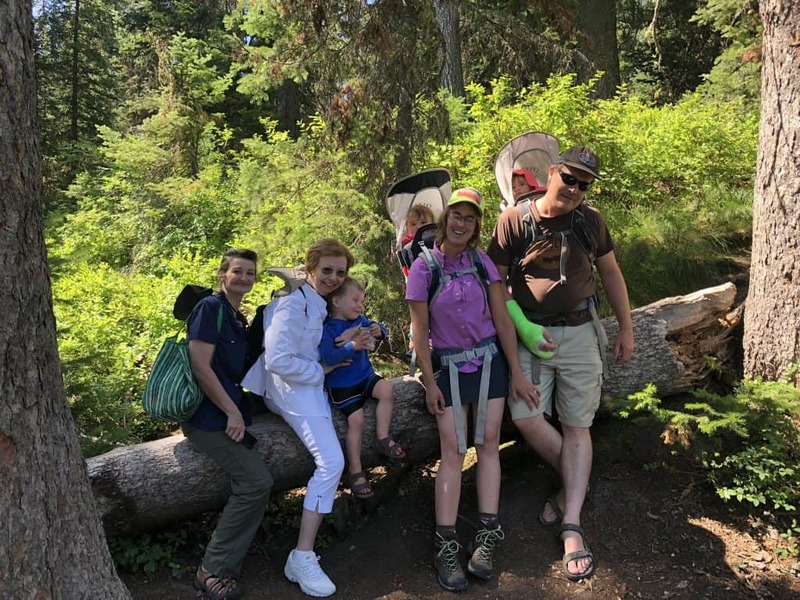 We were hiking carrying two babies, one preschooler, my parents who are in their 50s and my grandma who is 70ish (I’m sorry, I should know!) so that you can get a gauge of how difficult these are. Also, if you see things in GREEN, that is more detailed information about the trail such as exact directions to get there, elevation gain and more! 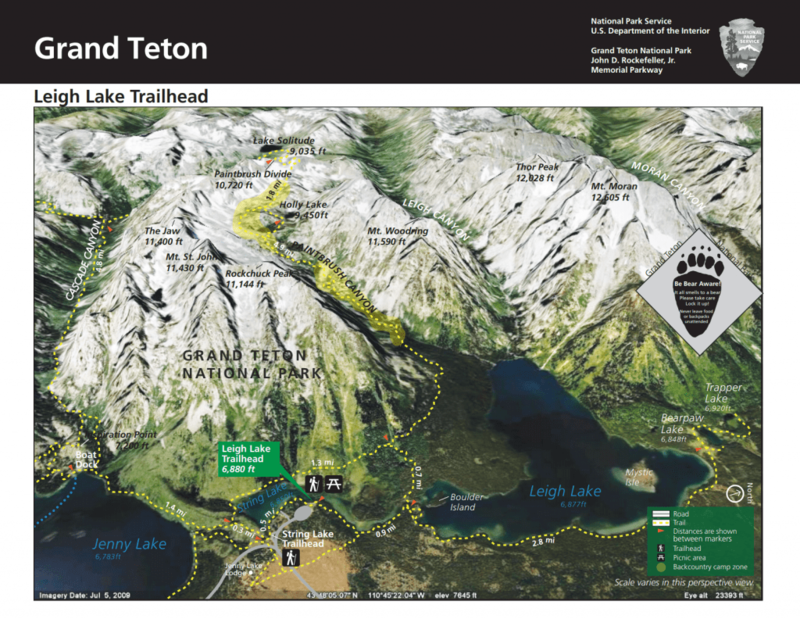 For a map of GTNP, click on this link! P.S. You HAVE to eat at Dornan’s on your way out! It has massive windows that give a gorgeous view of the Tetons, and their food is freaking amazing! Playing tour guide in Grand Teton National Park is something I never get bored of! This was on the trail to Hidden Falls after getting off the Jenny Lake Boat shuttle! Jenny Lake is MASSIVE! It is the second biggest Lake in the park, with Jackson Lake being the biggest. Anyways, the best place to get to Jenny Lake is by turning into the South Jenny Lake Junction. Boating across the lake is AWESOME and it’s something well worth the money! 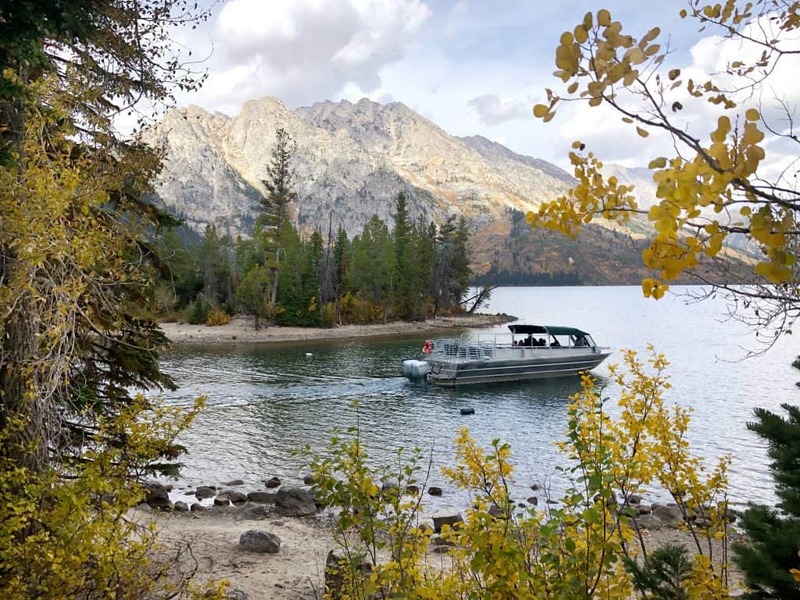 The shuttle is an open boat of sorts, and is a fun ride across the lake that will save some time if you want to access great spots like Inspiration Point (which unfortunately is closed ATM for resoration work as of 11/18) and the Hidden Falls trail! 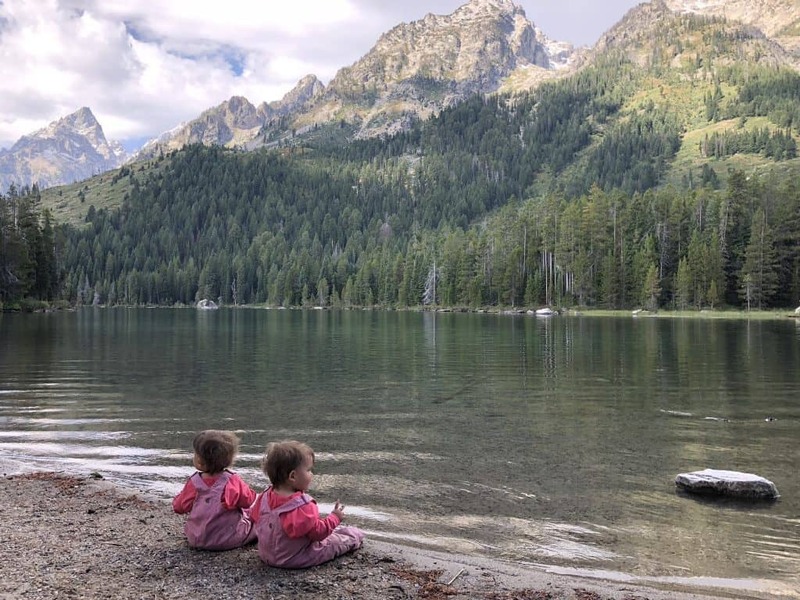 There are of course multiple trails around Jenny Lake, but with this being a family guide (including older people and younger ones!) the best bet for everyone to enjoy it is to take the shuttle! For more information on the shuttle as well as scenic floats, follow the previous links! We went on the shuttle and it was AMAZING! Definitely check out the trail list above in green – there are many options here! Check out the shuttle and rental services – this lake is fun to explore! This is possibly the most popular area in the park – arrive before 9 or expect to be parking on the road where you turned in at! Be sure to check out the Jenny Lake visitor center! You can get a Junior Ranger book from there too! The Jenny Lake Boat Shuttle and the view while waiting! You can tell this was during fall! This is a beautiful hike (I seem to be saying that about everything! I guess it’s all just beautiful!) that takes you to a super tall water fall! There’s tons of awesome small waterfalls on the way, as well as fun pit stops for kids to play and weary legs to rest. This hike offers plenty of beautiful river views, a tiny bit of elevation gain, but it is so worth it! At the end of the hike there is seating of sorts, so it’s a great place to have a snack. If you come at the height of summer season, expect some crowds! I went the day the shuttle closed, so it wasn’t super busy. You also are allowed to further explore and climb the rocks along the water fall. Just be careful because they are super slippery! 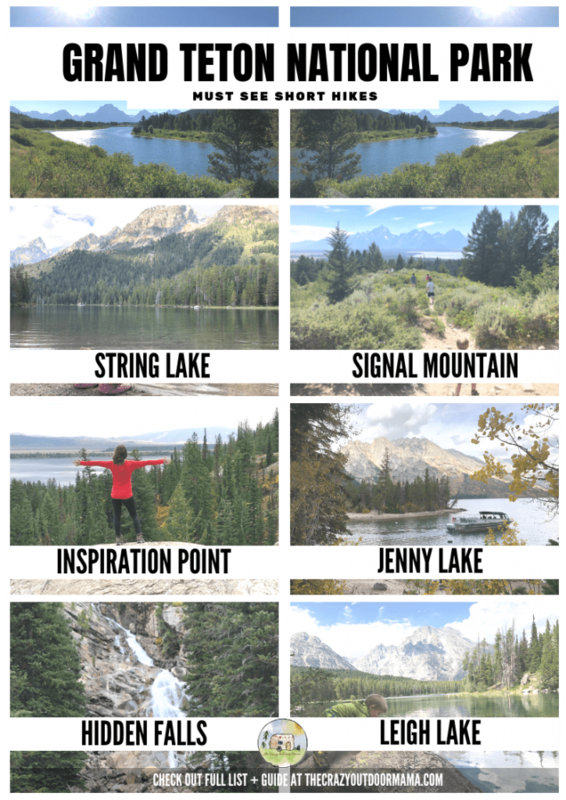 You may notice that the mileage for this hike is a bit more than others – I just wanted to include it because if you’re going to Jenny Lake, you should think about hiking to Hidden Falls as well! Once you come off the boat shuttle / ferry, the trail is clearly marked should you want to head to hidden falls! 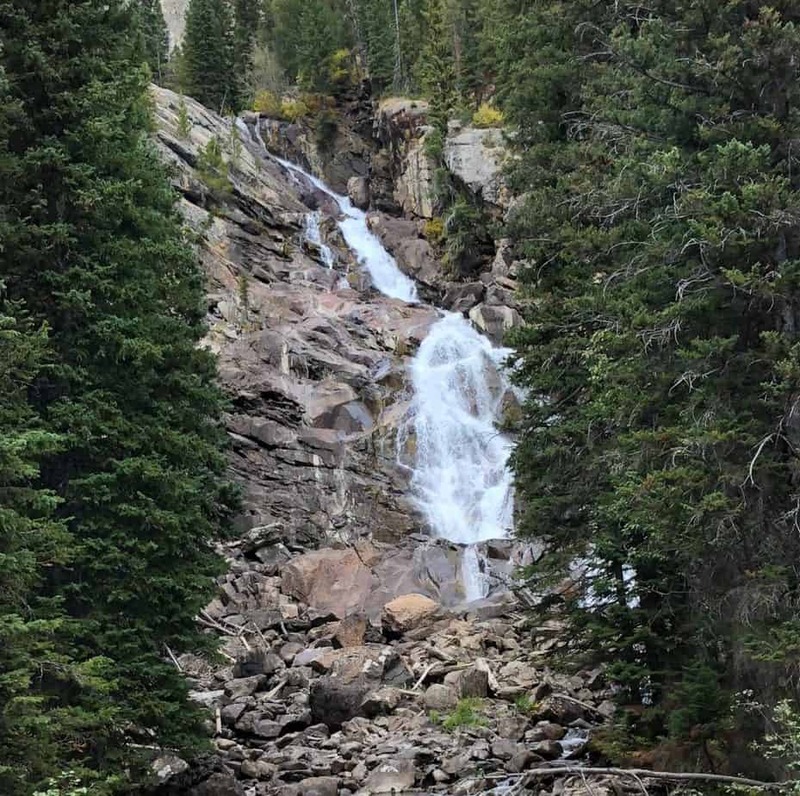 The Hidden Falls! Pictures can’t do this justice! If you have older kids, they’ll love exploring around this 200 ft waterfall! Heck, even I had fun! It’s like I’m creating a pyramid or something here! So, if you are visiting Jenny Lake, take the boat shuttle, and go to Hidden Falls… walk .5 more miles and check out Inspiration Point! It’s an amazing view of Jenny Lake as well as of the Tetons! This hike may not be best for those who aren’t sure footed or in the best of shape – there is a rocky kind of exposed section that might throw some people off. I did see people of all ages doing it though! To get on the Inspiration Point trail, head back out of the Hidden Falls trail back onto the main trail. There will be a sign for Inspiration Point, so head on over! I know that’s such an Instagram pose.. but it’s popular for a reason! It felt awesome to be able to see everything! Inspiration Point was a little rough at times, but if that makes you nervous just bring hiking sticks! String Lake is accessible pretty much from the parking lot! This is a great spot for simming, Stand up paddle boarding, and just general water play. I don’t know if there’s any fish there, but it really isn’t a good spot to try since there are so many kids and animals in the water. 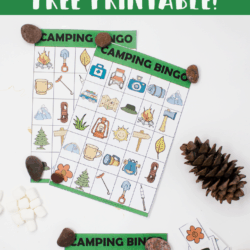 There are also tons of picnic areas with bear boxes as well as restrooms and such making it perfect for the whole family – even those who aren’t used to hiking and having to “find a bush”! 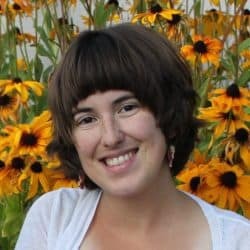 I wrote a fairly in depth Guide to String Lake if you’re interested in all the details, so head on over and check it out! Its not hard to see why String Lake is so popular! 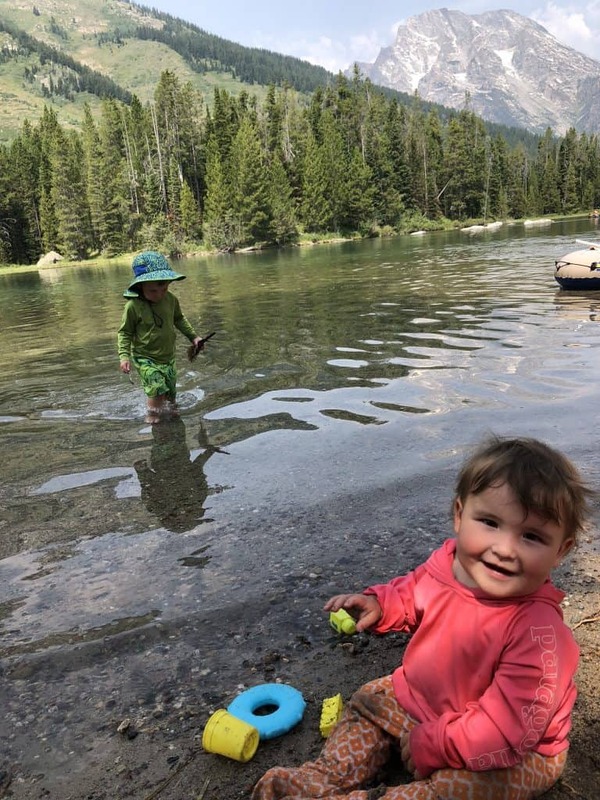 String Lake is a PERFECT spot to spend an afternoon with the family in Grand Teton National Park! Leigh Lake is another breath taking lake that actually happens to be right next to String Lake! 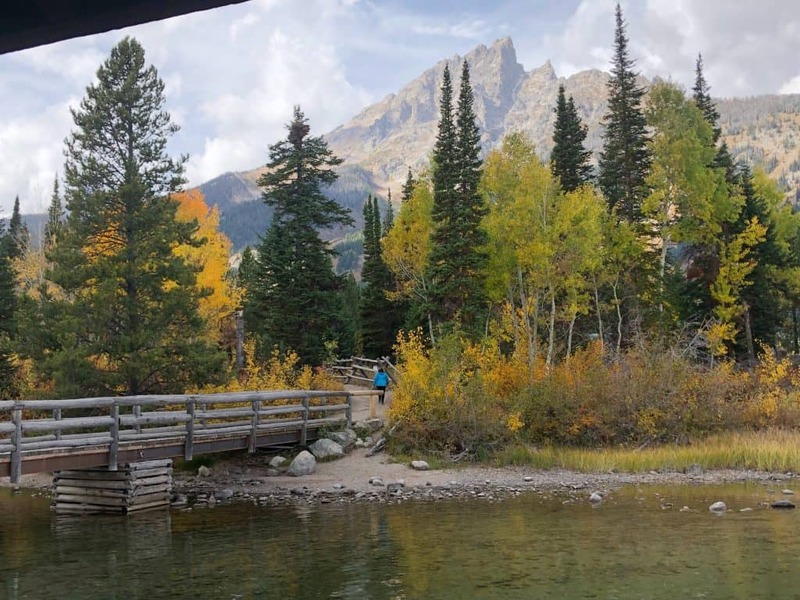 If you’re headed to String Lake, head to the right and you’ll see an informational bulletin with some stairs behind it – follow that to start the hike to Leigh Lake! While the hike can go on for quite a bit, we stopped at the portage which was about 0.9 miles in. It’s fairly flat and easy, and a perfect add on to your String Lake experience! P.S., below this picture is a map so that you can sort of tell how these lakes are laid out! Even if you just go to the portage, Leigh Lake is a must see! While it is a bit of a drive, the view from the top of Signal Mountain is beautiful! The road up the mountain is a windey, 5 mile ride but this is a great spot to look for moose and bears! So have your passengers keep an eye out while you’re driving! There is a small parking area at the top and the viewing is right next to it – it’s perfect for everyone! 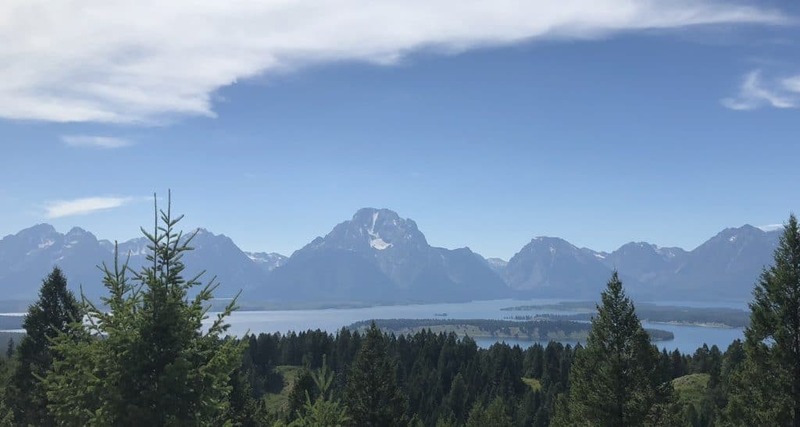 The Jackson Point overlook is only 200 ft from the parking lot and is a great view of part of Jackson Lake and the valley below! Signal Mountain is a fun drive up, plus there are possibilities fora add on sights for those who want to! These are all awesome hikes to do if you have limited time in the area, but if you have more time then you should check out these other hikes and areas! Not all of these are in the park, but everything is within half an hour or so! I can’t even count the amount of awesome things to be done here – both summer and winter! 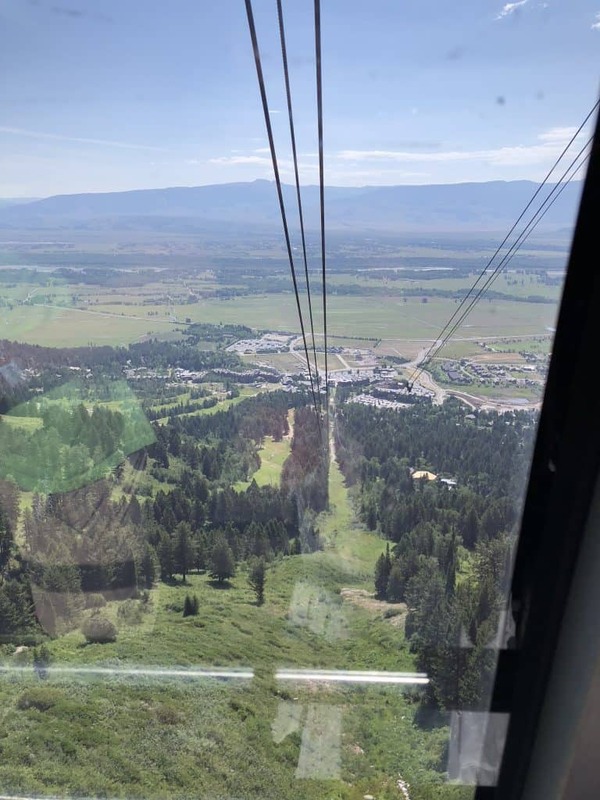 This resort is most famous for it’s aerial tram “Big Red”, but it also has tons of area for kids to run and play, sweet restaurants and more! The Tram – Imagine riding up 4,000 vertical feet in 12 minutes! The views are amazing, and there are some gourmet waffles at the top at Corbets Cabin! Check out prices and such here! Aerial Adventure Course – Imagine an awesome ropes course, but with added elements like balance beams, nets and ropes! It’s high adventure! Via Ferrata – Ever wanted to try out mountain climbing? Let the experts guide you and climb some awesome real mountain terrain! Mountain Biking – There’s multiple difficulty levels, and they have really worked on making it one of the best spots to mountain bike at! There are sometimes specials and events with this, check it out here! 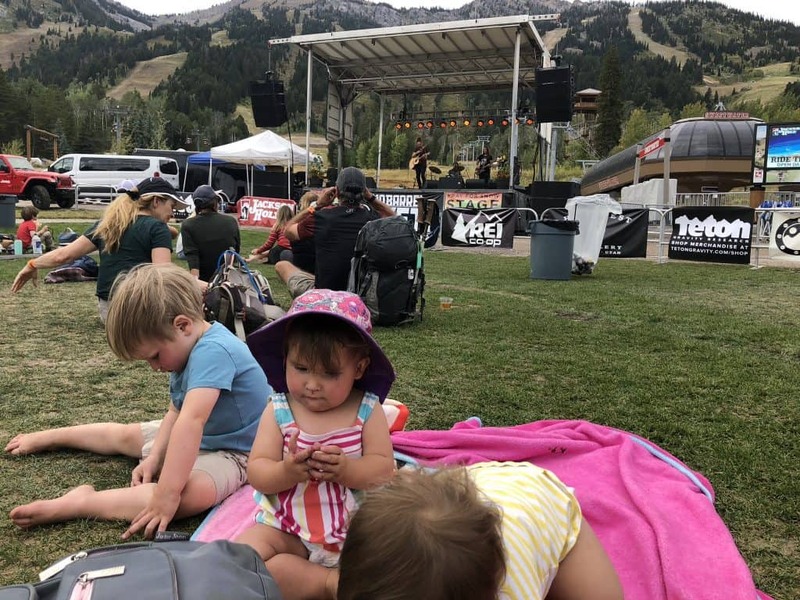 Awesome events ALL the time – Seeing as how this is the home base of Teton Gravity Research, as well as the stage for some awesome music, there are almost always events going on! Check out the calendar to see what will be going on when you visit! Big Red! Yes, that’s snow in July in the background there! The View from the tram! This is the town that you likely passed through on the way to the park! There’s so much to do and see! This is a fun break from hiking around, as well as a way to get a feel for the western mountain town style of Jackson! 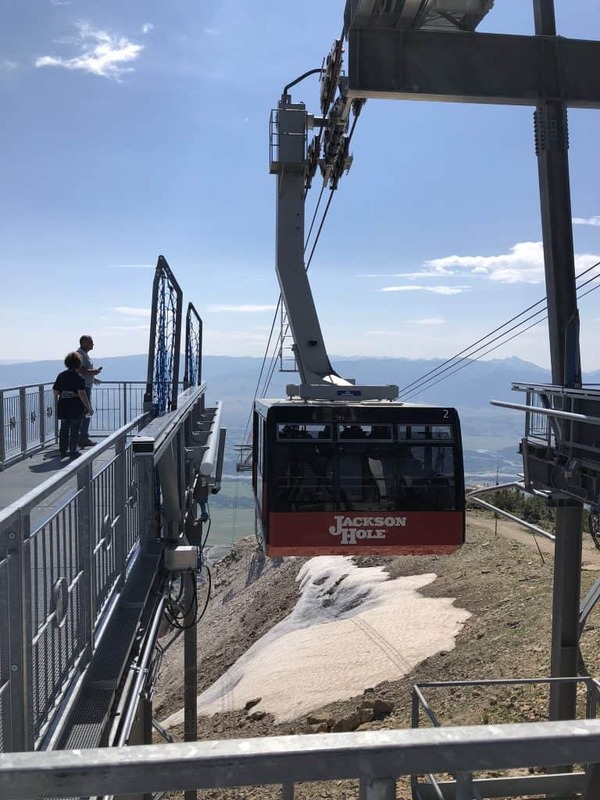 I wrote a Guide to Jackson Hole for Families that has over 15 fun things to do if you want to check that out! 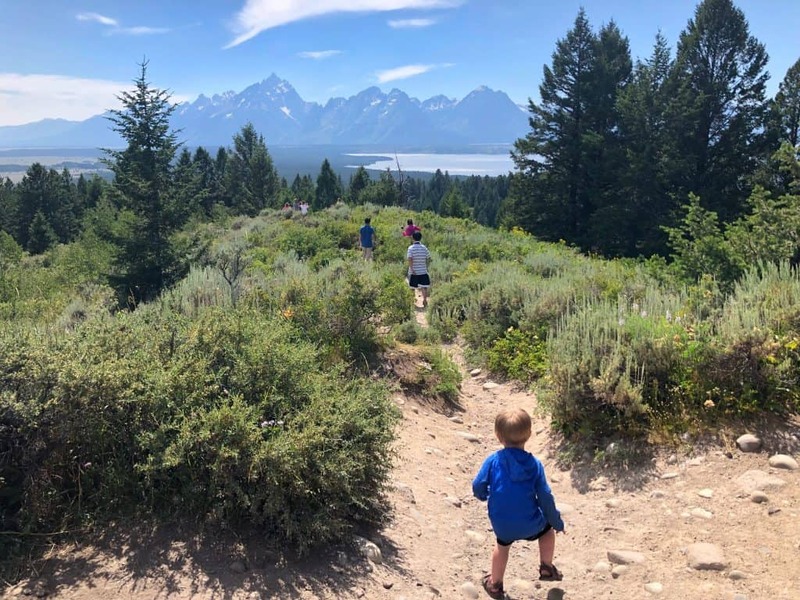 Here are some of the highlights of family activities in Jackson Wyoming! 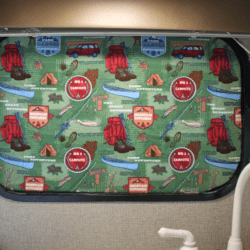 Horse Drawn Stage Coach Ride – If you aren’t around horses that much, or maybe you just think it would be awesome to ride in a stage coach, then you have to take this ride! The horses are beautiful and massive, and the stage coach is very western looking! Town Square Shootout – Every summer day (besides Sunday) at 6:00 pm, get a taste of the old west with a good old fashioned shoot out – right in town square! There’s people on buildings, bad guys, and more! It is really fun and the actors are pretty interactive if you get there early and get a good spot! Farmers Markets, Music on the Square and more! – Like the village, summer is a poppin time for the town square! Check out the calendar of events to see what’s going on in town! Do you have any favorites you frequent in Grand Teton National Park? Let me know in the comments! Want to soak and relax after a big day out? 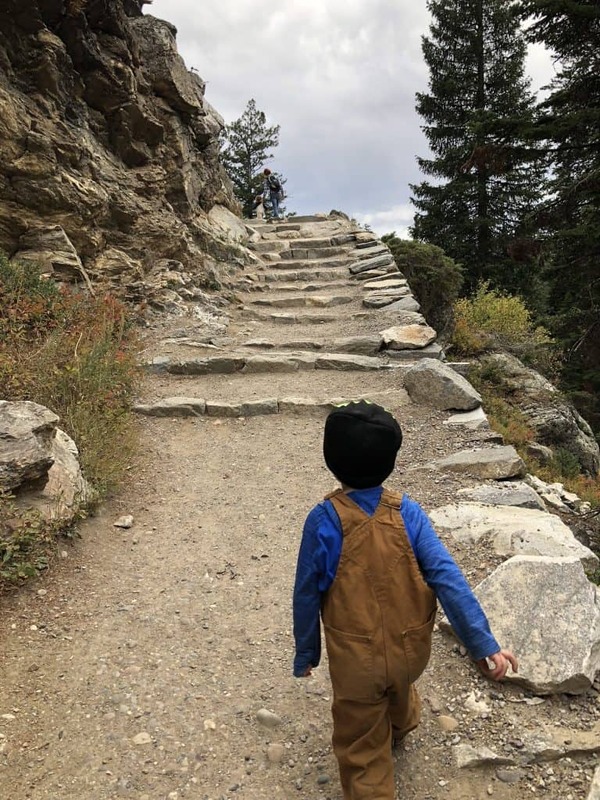 Bring the whole family to Granite Hot Springs – it’s about half an hour from Jackson, and has an amazing waterfall next to it!